Here's all the recipes listed under Regional Egg Dishes along with the comments posted by the breakfast lovers that submitted them. "This recipe with a crisp hash brown crust was featured at the beautiful Bay Breeze Bed & Breakfast in Fairhope, Alabama." 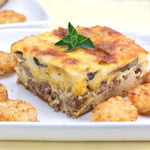 "An easy-to-make breakfast casserole with sausage, potatoes, cheese and eggs. Refrigerated biscuits required." 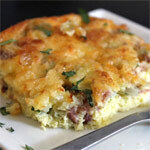 "A great breakfast skillet with bacon, cheese, potatoes, green peppers and onion. If desired, you could replace the Cheddar with Pepper Jack or another good shredded cheese." "A family favorite. We double the recipe to make extra empanadas for another day!" "A delightful breakfast dish consisting of ramekins filled with creamy polenta, Gruyere cheese and baked eggs." "Pepper Jack is great because it adds some kick. After the Poblano pepper cook they sweeten-up and loose their fire. I also like a teaspoon of good spicy salsa over my portion." "Southwestern flavors intermingle in this scramble of eggs and home-crisped tortilla strips with spicy tomato sauce and cheese." "Visit the Mr Breakfast glossary for more about frittatas." "This recipes was submitted to us by the Fish Creek House B&B in the heart of cowboy country in Whitehall, Montana. This is a great breakfast for starting your day on the ranch." "I made this for a curious relative, thinking I'd hate it personally. Surprise! I loved it! I hope you do too." 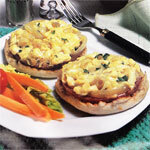 "Scrambled eggs with onions, parsley and hot sauce are served over English muffins with thinly sliced salami. From a vintage 1988 Tabasco sauce recipe booklet." "This is a recipe for a topping for English muffins or toast. It's a big favorite in the Midwest. Once you try it, you'll wanna try it again and again. Delicious!" "In this recipe, eggs are poached in a homemade tomato sauce with mushrooms, onion and garlic." "I got this recipe from Gourmet Magazine. 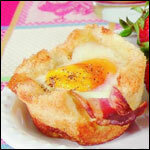 It's a great brunch dish and the rosemary bacon adds sophistication to a simple country dish." "The chili powder and cumen add a smokey kick. 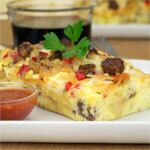 A great Tex-Mex breakfast that's fairly easy to prepare." "Wrap individually in saran wrap to refrigerate, then microwave on your way out the door. " "Add some hash browns, toast or warm flour tortillas and you will have a great breakfast. Or add a salad and have a nice treat for lunch or dinner." "Serve with toast and salsa for nice Southwestern breakfast." "My son loves grilled cheese but won't eat the crusts. However, he gobbles them up prepared like this for breakfast - and so does everyone else in the house!" "This omelet-style dish originated in Placerville, California (aka Hangtown) in the 1850's at the height of the California Gold Rush." 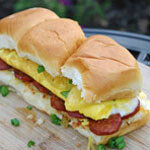 "Little breakfast sandwiches with eggs, cheese, sauteed onion, Portuguese sausage and pineapple. Wake up to a taste of the islands. Best served with tropical fruit as a side dish." "You can replace the bacon with cooked and crumbled sausage if desired. This is my recreation of a Vermont Bed And Breakfast recipe. Pure Vermont maple syrup is key." "Works well when making one or more omelets. Limited only by time and the amount of leftover calabacitas! Que Bueno!" "A delicious combination of eggs, bacon and ham over toast." 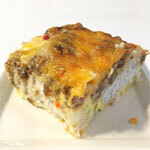 "A very tasy breakfast casserole recipe straight from my mom's little metal recipe box. Enjoy!" "These are chorizo breakfast burritos with Cheddar cheese and salsa. Easy to make and fun to eat." "Nothing like a whole mess of good things chucked together to make a great thing. Enjoy y'all!" "Just basic, delicious cheesy scrambled eggs. No fuss and very little mess." "For this casserole, you can adjust the amount of heat by using spicy or mild sausage and Pepper Jack or regular Jack cheese. For extra heat, add some chopped jalapenos." "This is very easy to make and it has a great Southwestern kick to it. Good for when company comes by." "This makes a great filling for breakfast burritos. I like it on whole wheat toast with a dab of salsa." "This easy-to-make breakfast pizza is topped with eggs, cheese, mushroom and green onions. Requires a pre-made pizza crust." "Success depends on how good the tamales are that you use. If you have leftover tamales from dinner and want a fun breakfast, give this a try." "This is my easy recipe for Huevos Rancheros, a great Mexican breakfast. You could also add a chopped jalapeno pepper if you like it spicy." "Yee ha! Howdy pardner, I hope you've got a big case of the hungries. This easy-to-make casserole is meant to satisfy big appetites." "The recipe is easily modified. 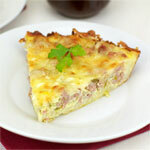 You might want to add cooked and crumbled bacon or sausage to the mix at the same time you add the corn chips." 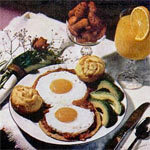 "A classic cowboy breakfast from a legendary cowboy, Tony Dorsett of the Dallas Cowboys. Includes his recipe for Ranchero Sauce. From a vintage issue of Ebony Magazine." "A heavy breakfast - but delicious! This recipe is fairly easy since it uses refrigerated biscuits." 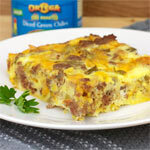 "All the taste of Western Omelet in a large casserole that's perfect for a group. This can be made the night before as long as it's refrigerated and well-wrapped in plastic wrap and you let it set out for 15 minutes before baking."